I came to Augusten Burroughs work through Dry, a memoir about his struggle with alcoholism, which is somehow both heartfelt and funny. Then I read Running with Scissors, his quirky coming-of-age story. 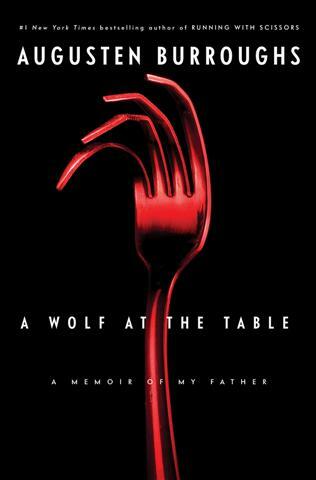 Wolf at the Table is completely different from the earlier works, exploring Mr. Burroughs’ relationship with his father, an emotionally distant alcoholic. It would be an understatement to say Mr. Burroughs finds his father lacking: His bitterness is so palpable, the book is hard to read. I love memoirs that explore fatherhood. In the 50s and 60s, fathers were almost always depicted as good and wholesome. As I kid, I could see my old man didn’t add up. How could he? Those depictions had little to do with reality. Nothing bad about Dad was every explored. Now we get something like Wolf at the Table, but this father is so clearly and irredeemably bad, it’s almost like a throw back to thin view of fathers from the 50s and 60s (albeit the other side of the coin). Burroughs father is as bad as Father Knows Best is good. How’s the for coming full circle? You have to feel bad for any adult lugging around so much resentment from childhood. One good thing about being a rebellious child: With my family, I always managed to keep the resentment ledgers pretty even. If you give as good as you get, you never have to feel bitter.